The file photo shows the Iranian Navy’s Alvand destroyer. Iran’s Navy chief says its forces have escorted 3,844 commercial ships to ensure their safe passage in the Gulf of Aden, where pirates are active. 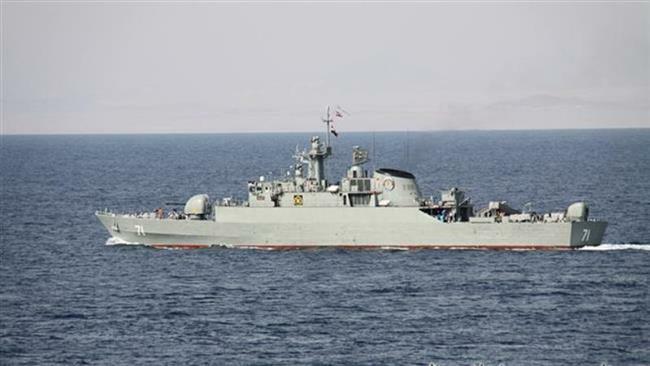 “Today, the strength of the Iranian Navy is on display in the high seas by ensuring the security of the country’s maritime routes,” Iran’s Navy Commander Rear Admiral Habibollah Sayyari said in the pre-sermon address to worshipers at the weekly Friday Prayers. He added that Iran’s coastal areas enjoy full security thanks to the naval forces’ might. The Navy chief pointed to Iran’s great achievements in defense and military sectors and emphasized that the Islamic Republic does not need any foreign power to supply its required equipment and has successfully conducted different military and naval drills by deploying domestically-manufactured products. “The Islamic Republic’s fleets are currently present in South Africa’s Port of Durban and the Islamic Republic of Iran’s flag has been raised in the high seas, [including] the Indian Ocean, the Atlantic Ocean and the Mediterranean Sea,” Sayyari pointed out. He added that Iranian naval forces are powerfully conducting their mission in the high seas to defend the country’s maritime borders and “allow no power to even think about [carrying out] any aggression” against the Islamic Republic. On November 21, Sayyari said an Iranian naval fleet entered the Atlantic Ocean for the first time after a port call in South Africa. “For the first time, the 44th flotilla of the Iranian Navy, consisting of the Alvand destroyer and the Bushehr [logistic vessel], succeeded in circling the African continent and have sailed into the Atlantic Ocean,” the Navy chief said. The dispatch of the 44th flotilla to the high seas shows the naval forces’ might and strength, he said and added that the Iranian Navy has also sent five other fleets carrying the message of peace and friendship to other countries. In line with international efforts against piracy, the Iranian Navy has been conducting patrols in the Gulf of Aden since November 2008, safeguarding merchant containers and oil tankers owned or leased by Iran or other countries. Iran’s Navy has managed to foil several attacks on both Iranian and foreign tankers during its missions in international waters.